Our farm is located in the fertile, pastoral Bekaa valley where our cows graze freely during the summer. In winter, our cows stay indoors in hangars that have been specifically designed with their comfort and health in mind. The hangars are extremely spacious and airy and were built to optimize the flow of air, maximize the light and allow our cows to rest, stand and move around freely. They are open on the North side, where the sun rises and where it is less windy. On the South side, the opening is made smaller to protect our cows from the direct strong sun. In the middle of the hangar is the feeding alley, where our cows eat and rest on each side. Our cows are pampered with special bedding made of different layers of rubber that reduce the heat and protect them from the humidity for absolute comfort. The farm is cleaned 3 times a day to ensure that the environment our cows reside in is comfortable. Everybody at the farm works towards our cows’ comfort, making sure they have access to nutritious feed, excellent healthcare and continuous human care. Best thing about working on the Farm? Knowing that I am contributing to providing quality dairy products to the community. Plus, Animals are far more predictable than humans ! Our cattle include 239 healthy and happy cows that originate from Holland and France. Our farm has two cow breeds: The Holstein and the Montbeliarde. What are the differences between the two breeds? The Holstein cow is black and white; thin and taller while the Montbeliarde cow is brown and white; fattier and shorter. All of our cows wear ear tags with a unique number that helps identify them as well as collars around their necks with a chip that monitors their health and wellbeing at all times. These trinkets contain information on the cow’s date of birth and its lineage, track the quantity of milk produced and allow our farmers to follow the cows’ pregnancies and health throughout. All of this information is unified and compiled in an electronic ‘passport’. Each and every one of our cows follows a thorough year-round vaccination cycle that is supervised by our veterinarian who makes sure they are and stay healthy. We provide special care to our newborn calves/baby cows. We look after them in a special area where they are given additional dedicated care to ensure that they grow in a protected environment and receive the attention they need. During the first 24 hours, newborn calves drink their mothers’ milk which is nutrient-rich and a great source of energy. The milk contains antibodies that help protect the calves from potential diseases in their first weeks of life. Calves are then gradually introduced to other foods suited for their age and size under the supervision of our veterinarian. Holstein cows are excellent milk producers. They adapt easily to different environments and are the most common breed of cows found in Lebanon. Montbeliarde cows are known to be strong and adaptable to many environments. The milk they produce is great for cheese-making as it is high in protein. Sobbhiyé was born on January 30th, 2011 and is a happy mother of 2 calves. On average, she produces 43.1 liters of silky milk per day. Cowsette was born on January 29th, 2013 and is a happy mother of a calf. On average, she produces 38.4 liters of yummy milk per day. We provide special care to our newborn calves/baby cows. We look after them in a special area where they are given additional dedicated care to ensure that they grow in a protected environment and receive the attention they need. During the first 24 hours, newborn calves drink their mothers’ milk which is nutrient-rich and a great source of energy. The milk contains antibodies that help protect the calves from potential diseases in their first weeks of life. Calves are then gradually introduced to other foods suited for their age and size under the supervision of our veterinary. Our cows follow a healthy and balanced diet plan specially created for them. Their feed is nutritious and rich in protein and energy, packed with fiber and loaded with vitamins and minerals which are essential for producing quality milk. Each cow consumes an average of 55kg of feed per day! Corn is steamed and made soft and flaky to increase its density. It increases the feeding value of corn, improves the growth performance of our cows and helps them produce more milk. Bran is the external part of cereal grains and one of the main components of our cows’ diet thanks to its rich content in protein, nutrients and fibers. Barley is the most common cereal grain used to feed dairy cattle. It is a high source of energy for our cows that is easily digestible. Cotton seeds are great food supplements for our cows. They are a great source of fibers, good fat (cottonseed oil) and protein. Despite being a byproduct of sugar beet that was dried and compressed, sugar beet pulp is very low in sugar and carbohydrates but high in energy and fibers. Packed with fiber, yeast is used as feed supplements that help improve our cows’ digestion. Rich in starch, corn constitutes an important source of energy for our cows that in turn increases the production of milk. Alfalfa is a plant that provides most of our cows’ needs in minerals and vitamins. It is also rich in calcium, magnesium, potassium, phosphorus and zinc and a great source of Vitamins A, E, D, K and riboflavin and niacin. Hay is a key ingredient in every cattle diet program. Mainly high in fibers and energy content, it eases our cows’ digestive system and is an ideal feed for our pregnant and lactating cows. Corn silage is the entire corn plant (including the leaves) that has been fermented. It is an excellent source of energy and it is loaded with vitamins, especially folic acid and vitamin B12. Alfalfa silage improves our cows’ intake of forage and increase the level of milk protein without changing the level of fat. Fresh water is a vital nutrient for our cows that is directly linked to their health and to the quality of the milk produced. On average, a cow consumes 25 gallons of water each day. Our cows are milked in an automated milking parlor twice a day: once in the morning at 11am and a second time in the afternoon at 5 pm. On average, 24 liters of milk are produced per cow, per day. However, it only takes as little as a few milliliters of milk to assess its quality. When giving milk, our cows are linked to a computerized system through a transponder device which transmits relevant measurement data for analysis such as the quantity of milk produced. The milk is refrigerated and kept fresh in special stainless steel holding tanks that maintain the temperature at 3 to 4°C. We then collect samples to test milk quality and check the temperature of the milk before transporting it to our factory in refrigerated tankers that keep the milk clean and cold. 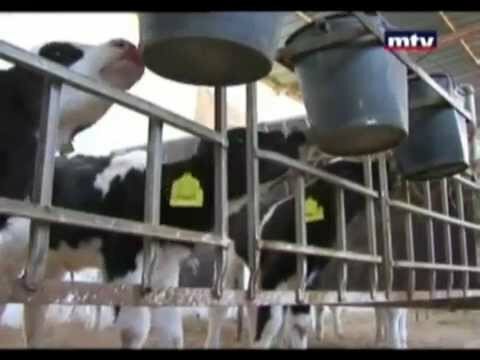 Using front-edge techniques from the States and Sweden, milk is kept in the most optimal conditions from the Bekaa all the way to your breakfast table. In brief, we work hard to ensure high standards of milk production. discover our farm in the Bekaa valley.